The American Camellia Society's American Camellia Trail project is a partnership of public gardens with notable collections located across the country. To identify, recognize and draw attention to public camellia gardens which the Society determines to be of national status. To award such gardens a Certificate of Recognition to publicize both the garden and the Society. Reorganized gardens will be able to make use of this status as they find appropriate means to promote their maintenance, expansion, funding or special projects. To provide such gardens with the opportunity to network, or to develop exchange programs as they may find to their mutual benefit. The garden is well established, and the ownership and management structures are stable. The garden is open regularly to the public. Admission may be free, by donation or by set fee as the garden determines for its needs. The garden need not be devoted completely to camellias, but must feature them prominently, be accessible and maintained to a high standard in a manner suitable to the garden and its climate. A minimum collection of 50 cultivars and/or species is required and those of historical significance will be eligible for recognition. The garden maintains a register of all its camellias, and their location in the garden. All cultivars and species have identifying labels. The garden will have camellia cultural information along with other materials related to camellias available to visiting members of the public. The garden shall be a member of the American Camellia Society, and shall agree to display information about the Society, including contact addresses, to be available for prospective members. Research programs on camellia culture, heat or cold }olerance, pest or disease control, or other subjects adding to the overall knowledge of camellias. Shows or displays during flowering times. Demonstrations and/or seminars of good growing practices such as pruning, at appropriate times. The maintenance of special theme collections such as species or named sasanqua cultivars. The stocking of camellia literature for sale and/or publication of such literature by the garden itself. Any other initiative by the garden which promotes enthusiasm for and better growing of camellias. Applications for recognition may be initiated by an ACS Director or Officer or by the garden concerned, and should be addressed to the ACS Camellia Trail Committee Chair. The nomination form requires appropriate information relative to the criteria. 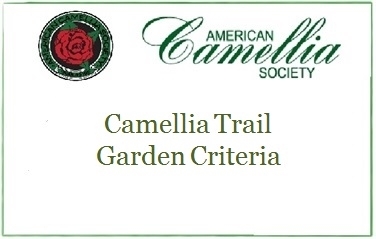 The form is available at https://www.americancamellias.com/about-american-camellia-society/american-camellia-trail-gardens/acs-camellia-trail-nomination-form and may be submitted online. Next, email high quality photographs of the camellia garden (preferably in bloom), one per message, to ask@americancamellias.org. You may view a list of Camellia Trail Gardens under the "About" option on the ACS website. The Camellia Trail Committee will review the nomination and determine if the garden has met the noted criteria. If favorable, the garden will be contacted by the Executive Director of the American Camellia Society. Each garden shall maintain a Register of gardens which have received the award. Each garden is to be reviewed every fifth year. The designation may be revoked by the Camellia Trail Committee if the maintenance and operation of the garden are perceived to have fallen below the standard of the Criteria. A Board Member of the American Camellia Society or Camellia Trail Committee who feels that a certificated garden may have fallen below criteria standards may request the Executive to have the garden reviewed at any time, that is, prior to the normal five year review.